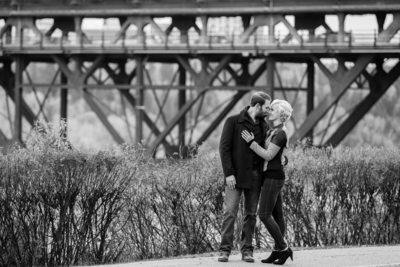 We love creating amazing photographs of our engaged couples here in Edmonton. 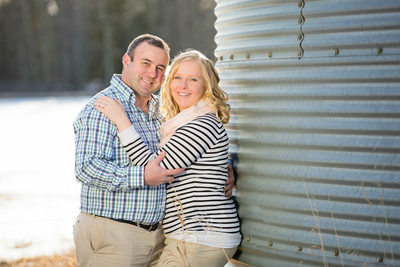 When it comes to engagement portraits we want to capture who you are and what you love you do as a couple. We have so many options when it comes to locations because your relationship is completely different from everyone else. 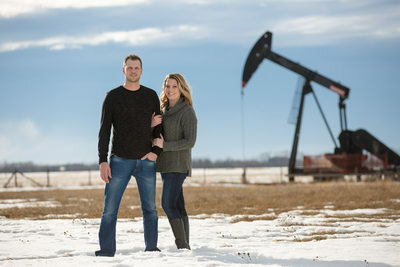 If you look at our gallery you will see the popular locations like the Edmonton River Valley, The Legislative Grounds and Downtown Edmonton but you will also see places like Telus Field, Outdoor rinks, Leduc Oilfield, Hay sheds, and Canola fields. 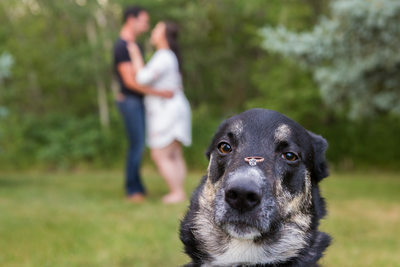 The reason for this is because when people look at your engagement photos hanging on your wall we want them to say "Of course they included hockey that's what they love doing together" or "How did their photographer manage to capture all 4 of their dogs looking at the camera?" 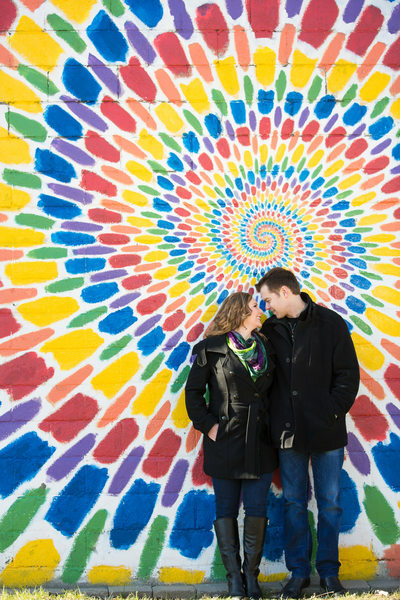 When it comes to what time of year is best for your engagement photos we like to suggest choosing an opposite season to whenever your wedding is. This way you get something completely different than your wedding photos. 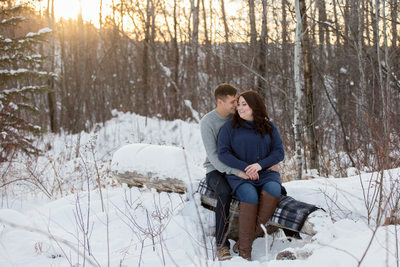 Our favourite time of year to do an engagement session is the winter or fall. With fall it is obvious because the colours are so amazing! For the winter it's because you can combine lots of activities like sledding, skating, building a snowman or just throwing snow at each other always creates some natural laughter! 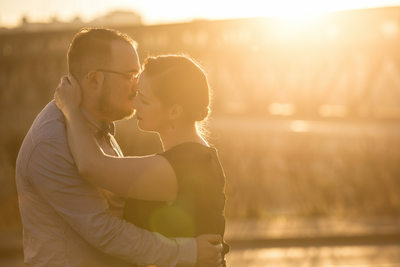 So why should you do engagement photos? We have found that couples are more at ease when we show up on the wedding day. We have already worked together and helped you with posing and the ever famous question "what do I do with my hands in this pose?" 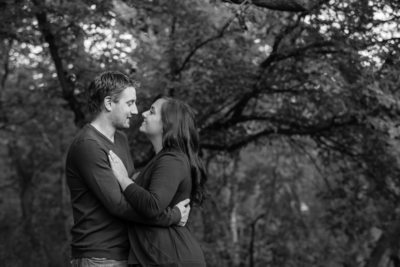 Our engagement portraits usually end up being an hour but we don't put a time limit on it, we photograph until we feel that we have captured everything we need as well as any requests that you have made. If you would like to bring any props like a sign with your wedding date on it, or matching hockey jersey's we are more than happy to incorporate them into your session. 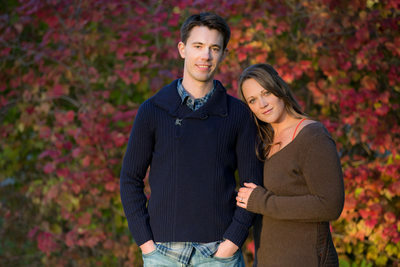 One of the most commonly asked questions we get is what should we wear for our engagement session? We recommend staying away from any clothing with large logos or words as the image can look more like an ad than a portrait. Think about the time of year that we will be photographing you and plan accordingly. If you are having a difficult time trying to decide what to wear we suggest bringing both outfits and you can change half way through the portrait session if you wish. This also works well if you want to have a casual look to start and then a more formal look later on. This way you get the best of both worlds. 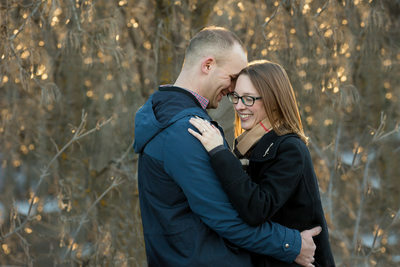 We don't just take engagement pictures in Edmonton, Spruce Grove, St.Albert and Leduc we also love to photograph in Devon, Sherwood Park, Fort Saskatchewan, and Stony Plain. We even travel to Red Deer, Camrose, Airdrie and Calgary not to mention Canmore, Banff and Jasper. 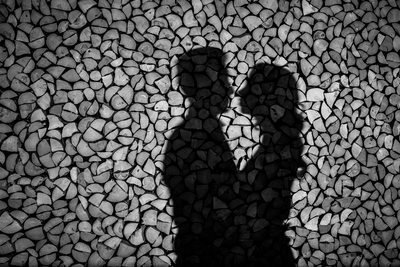 If you would like more information on what is included with our engagement portraits please head over to our contact page.